Over 10,000 Athletes Competing in SportsFest – Promoter and Master of Ceremonies will be Legendary Bodybuilder Bill Grant, Mr. America and Mr. World. Bill Grant appeared in the new release of “Pumping Iron” starring Arnold Schwarzenegger and has also been featured in numerous movies, television shows and commercials. 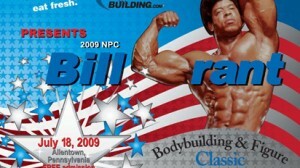 The 5th Annual NPC Bill Grant Bodybuilding and Figure Classic will be held at Cedar Beach Park in Allentown, Pennsylvania on Saturday, July 17, 2010 at 1:00 PM. It is part of the Lehigh Valley Sports Fest, a sporting event drawing thousands of athletes and spectators from around the globe. Admission is FREE for all spectators. *** NEWS FLASH*** Scott Epstein, former Vice President of the World Body Building Guild (WBBG) Pro & NPC divisions and currently the Executive Director of Publicity Management Services (PMS), a Media Relations/Talent Booking firm has announced his sponsorship for this event by signing guest appearances of top rated current athletes easily recognizable from syndicated TV. Be on hand to meet and greet Rob Terry, TNA Global Champion & 5X Mr. Wales. Rob, known on the wrestling circle as “The FREAK”, currently wrestles all over the world and is featured multiple times weekly on Spike TV as well as PPV. Fans will not want to miss out on getting an 8×10 glossy photo autographed and/or their picture taken with the TNA wrestling and bodybuilding superstar. “Rob Terry fully reminds me of Louie (Ferrigno) when he broke into the business, except Rob is clearly much bigger proportionally & already globally recognized in both bodybuilding and wrestling markets, “Epstein says.“ The amount of movie casting personnel and product endorsement people calling is overwhelming so we can be selective to Rob’s true beliefs”. In addition, PMS will be hosting recent NBC American Gladiator Fury (Jamie Kovac) for the event. Fury worked with Hulk Hogan as a Gladiator and he inspired her to train harder. She has competed in NPC bodybuilding and figure competitions in the past, doing her first “Strongman” shortly, and has developed into a 160 pound lean mean machine. Fury will also be signing autographs and taking pictures with fans. We will not stop here. Also appearing courtesy of PMS is former WWE/WCW/TNA diva & wrestler Ryan Shamrock. Ryan is in incredible shape and competing in an NPC figure contest the following week. Perhaps she’ll decide to enter this one which based on what we’ve seen recently she would walk with the gold! This event will be held at Cedar Beach Park, S. Ott Street at Hamilton Street in Allentown, Pennsylvania. Registration will begin at 10:00 am, with prejudging starting at 1:00pm and Finals will begin 1 hour after prejudging. For more information about this event please visit http://www.billgrant.net and www.sportsfest.org. For additional information about this event please contact Eva Sot 973-420-5695 or ems@billgrant.net.